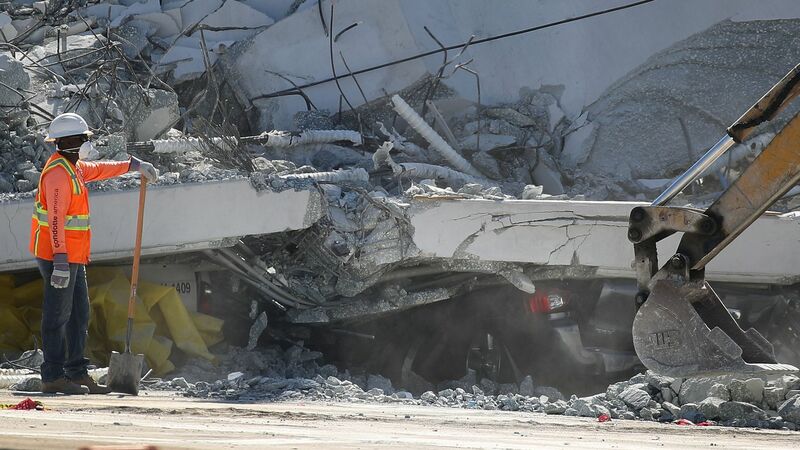 The Miami Herald reports that an engineer on the bridge that collapsed Thursday, taking at least six lives, warned the Florida Department of Transportation earlier in the week of "cracking" in the concrete. "“Hey Tom, this is Denney Pate with FIGG bridge engineers. Calling to, uh, share with you some information about the FIU pedestrian bridge and some cracking that’s been observed...[O]bviously some repairs or whatever will have to be done but from a safety perspective we don't see that there's any issue." The FDOT told the Miami Herald that Pate's voicemail "wasn't heard by any of its employees until...after the bridge fell." Cracking is "not unusual in concrete construction," per the Herald. The collapse is being investigated by the National Transportation Safety Board.